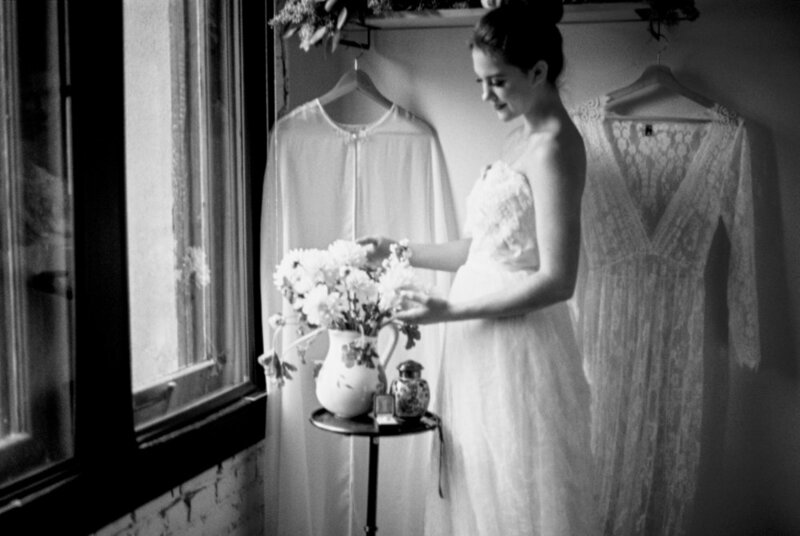 So thrilled to have been featured on Oregon Bride Magazine! This shoot is solely a ode to my mother and the beauty she found in winter. I grew up always hearing, "I'd rather have flowers on my table than diamonds on my hand." Even in the dead of winter she'd find way to brighten our home with flowers. I specifically remember a porcelain blue vase she had that was very special to her. A vase that was passed down from her grandmother, to her mother and then to her. Throughout the seasons it would house roses, sweet peas, autumn branches, etc. but my favorite is when she'd fill them with baby blue hydrangeas. I wanted to highlight this memory because winter is often thought of as cold and harsh but it truly can be beautiful and elegant. Adding roots, both emotionally and literally, is so important when choosing your wedding flowers. As a wedding photographer I adore hearing stories behind a bride's choice in flowers and the ones that especially touch my heart are the ones with meaning behind them. They were her grandmothers favorite, they remind her of her childhood, they are the same color as her groom's eyes; all of these are subtle yet personal glimpses of her on the most important day of her life. I would love if the tradition were kept alive and embraced. Personal and thoughtful flowers are always beautiful in my opinion.